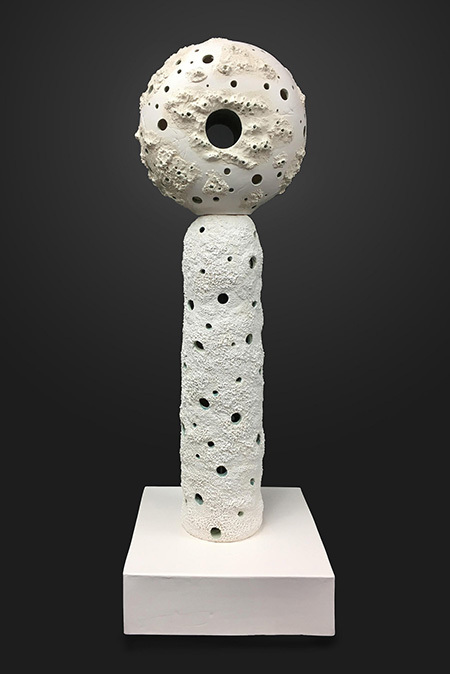 Joan Takayama-Ogawa, "The Great Barrier Reef,” 2016, ceramic, 43 1/2 x 15 1/2 x 15 1/2"
Los Angeles ceramic artist, Joan Takayama-Ogawa is having “a moment,” with concurrent solo shows in Pomona and Claremont. Given her decades-long career, Takayama-Ogawa is a living witness to the development of a ceramic culture in Los Angeles, a world that is a complex cacophony of different voices, techniques, styles and philosophies. As a student of Ralph Bacerra, she usually occupies the corner that explores beauty, decoration, ornamentation and narrative with unabashed exuberance. Her new pieces at AMOCA, however, are a departure, the “Climate Change” title referencing the departure of the exquisite colored coral reefs that so recently graced our shores. Due to climate change, the reefs are now bereft of their many hues and stand starkly bleached, like the bones of the dead. Deviating from her signature strong glazes, touched with gold and laced with humor in favor of a blanched and scarred memorial to things past, Takayama-Ogawa has created an earthen mourning to this mass death. A white perforated pillar topped by a disc with its center punched out faces us accusingly and blindly, reproving all of us as accessories to an environmental crime.